North Korea’s agreement to enter into talks with the United States could be a diplomatic breakthrough to reach a peaceful resolution to the nuclear crisis, or a ruse to weaken sanctions, or both. North Korean leader Kim Jong Un’s willingness to engage with the United States in negotiations to end his country’s nuclear weapons program, and his promise to suspend nuclear and missile tests while talks are under way, was reported on Tuesday by Chung Eui-yong, the head of South Korea’s National Security Office, following his meeting with Kim in Pyongyang. The North Korean government has not yet confirmed the South Korean interpretation of the potential diplomatic breakthrough. In fact the North’s state newspaper, Rodong Sinmun, on Wednesday ran a seemingly contradictory column that justified the nation’s nuclear deterrence as necessary to protect “against U.S. nuclear threats,” and said the issue is not open to dispute. The South Korean Unification Ministry on Wednesday refuted the newspaper’s uncompromising stance and said the Kim government’s position, as communicated to the South Korean envoy, is open to end its nuclear program under the right conditions. “North Korea clearly stated its willingness to denuclearize, and also clarified that it had no reason to retain nuclear weapons if the military threat against North Korea is resolved and regime security is guaranteed,” said Baik Tae-hyun, spokesperson for the Unification Ministry. In this photo provided by South Korea Presidential Blue House via Yonhap News Agency, Kim Yong Chol, vice chairman of North Korea's ruling Workers' Party Central Committee, second from right, talks with South Korean delegation in Pyongyang, North Korea. North Korea has broken past agreements to end its nuclear program, in exchange for economic assistance and security guarantees. In the last two years, the Kim Jong Un government accelerated long-range ballistic missile and nuclear tests, defiantly declared North Korea a nuclear weapons state, and moved closer to developing operational capability to target U.S. mainland cities with a nuclear-armed intercontinental ballistic missile. 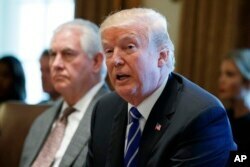 U.S. President Donald Trump has responded with a “maximum pressure” strategy to force Pyongyang to halt its nuclear program by imposing tough sanctions that ban billions of dollars worth of North Korean coal, iron ore, clothing products and seafood exports. The Trump administration has also emphasized a willingness to use military force, if needed, to eliminate the nuclear threat. The South Korean chief envoy, along with Suh Hoon, the head of the National Intelligence Service, will travel this week to Washington to brief U.S. security officials on their findings. They will also visit Beijing, Moscow and Tokyo to brief officials. Trump said North Korea seems “sincere” in its offer to engage in talks. But Vice President Mike Pence emphasized that the United States will keep up sanctions pressure until Pyongyang takes significant measures to halt its nuclear program. Japan also voiced strong support for maintaining economic sanctions on North Korea while any talks are underway. Secretary of State Rex Tillerson listens as President Donald Trump announces that the United States will designate North Korea a state sponsor of terrorism during a cabinet meeting at the White House, Nov. 20, 2017, in Washington. "If we were to have a meaningful discussion, North Korea needs to commit to a denuclearization plan that is verifiable, and irreversible. They need to take specific action. This is of utmost importance," said Japanese Chief Cabinet Secretary Yoshihide Suga. China has encouraged reconciliation efforts, but the Global Times, a state-run newspaper, published an editorial on Wednesday emphasizing that China, Russia and the United Nations Security Council must also be included in negotiations to resolve the Korean nuclear issue. Analysts view North Korea’s offer to hold nuclear talks, while also suspending provocative tests, with a mix of cautious optimism and skepticism. "We should just continue talks forever as far as I am concerned, because if they do not conduct nuclear tests and if they do not conduct missile flight tests, that’s a win," said regional security analyst Daniel Pinkston with Troy University in Seoul. While engaging in talks may be a positive step, it is unclear that the United States and North Korea can even agree on what denuclearization means. Washington wants to dismantle Pyongyang’s nuclear program, but North Korea’s longstanding requirement for denuclearization includes the removal of all U.S. forces from the Korean Peninsula, and the withdrawal of the American commitment to use its nuclear arsenal to defend its allies in the region. "They say if you will remove those things that will make North Korea feel more secure, and then at that point North Korea will be in a position to consider, that is their word, consider denuclearization," said Evans Revere, a security analyst at the Albright Stonebridge Group and a former State Department official who was involved in past negotiations with North Korea. There are also concerns that the Kim government is only offering to engage in talks to extract concessions from South Korean President Moon Jae-in when they meet for a summit in late April. The agreement to hold an inter-Korean leaders summit at the truce village of Panmunjom, on the South Korean side of the demilitarized zone border region, was also worked out during the envoy’s visit to Pyongyang. This will be the first meeting of leaders from North and South since 2007. South Korean President Moon Jae-in, from left, first lady Kim Jung-sook, Ivanka Trump, daughter of U.S. President Donald Trump, and Chinese Vice Premier Liu Yandong applaud as athletes from North and South Korea walk together at the closing ceremony. The progressive South Korean leader has tried to encourage the North’s cooperation through engagement, most recently by facilitating Pyongyang’s participation in the winter Olympics. Some worry Moon may seek an exemption from sanctions, to offer the North economic incentives when he meets with Kim in April, such as reopening the jointly run Kaesong Industrial Complex that employed over 5,000 North Korean workers until it was shut down following a Pyongyang nuclear test in 2016. "Anything that would weaken or dilute the impact of existing economic sanctions on North Korea would be a great mistake," said Bong Young-shik, a political analyst with the Yonsei University's Institute for North Korean Studies in Seoul. However President Moon on Wednesday said there are no plans to ease sanctions related to the summit, according to the South's Yonhap news agency.